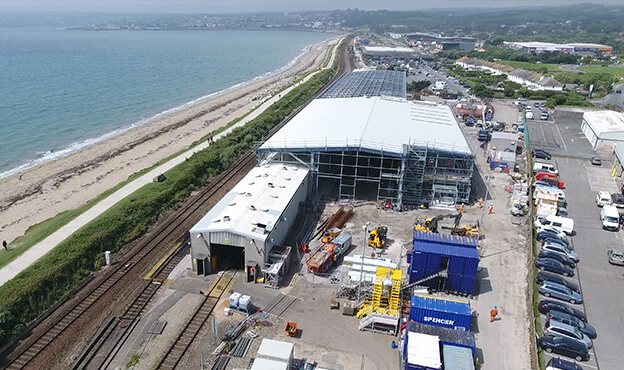 Great Western Railway is looking to improve its service with a new £20million depot at Long Rock in Penzance. 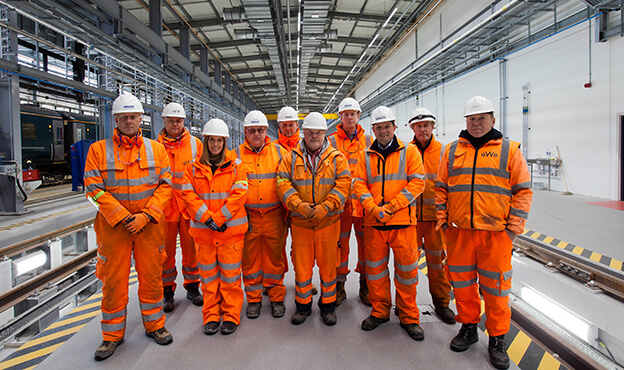 Through a strong collaborative working relationship between Spencer Group, GWR and the Depot team, the project was completed to the accelerated programme with zero impact to depot operations. 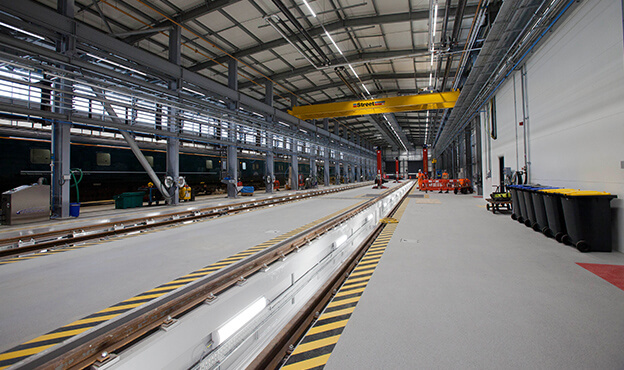 Spencer Group took two projects – the construction of a new Train Care Depot and the refurbishment of an existing High-Speed Train shed – and designed a solution to construct one facility, incorporating the old shed within the new building using an innovative envelope and cantilever steelwork design. We constructed a slightly taller portal frame shed, designed to enable installation of the new building’s roof sheeting with the original shed untouched below. We used a moveable encapsulation shield to remove the old High-Speed Train shed asbestos roof/wall sheeting, maintaining the 24hour operational requirements of the depot while ensuring the asbestos was contained. We then removed the structural steel rafters from the old shed, painted old steel to remain, and connected the old shed columns to the new shed cantilevered portal rafters. The works at Penzance were part of a wider commitment to the South West as part of the £80m ‘National Strategic Investment Strategy’ for 2017 and beyond. 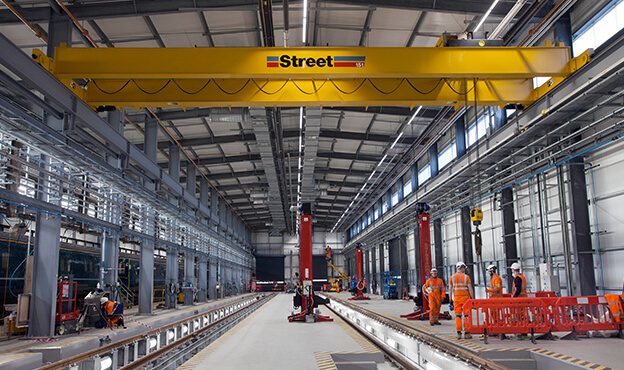 The original contract completion date was April 2018, but due to transition of rolling stock from Old Oak Common, the contract was instructed to accelerate by 17 weeks, completing by 5/12/17. We hit every major project milestone through detailed planning, hard work and dedication by the Project team. 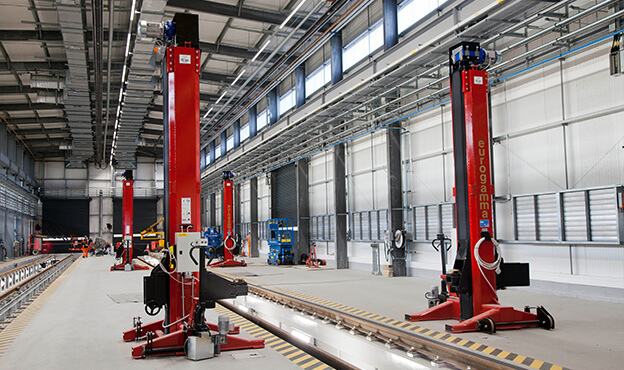 Our collaborative partnership with GWR was key, and the relationship with the depot manager was excellent throughout, allowing Spencer Group to run the project efficiently, to a robust access strategy, with no unplanned disruption to the depot - we kept the High-Speed Train shed operational and its services live throughout, in accordance with our integrated services strategy.